Switching over to cloth wipes instead of tissues has changed the way we consume paper products. Yeah yeah, I've talked about this before. But there are new developments in the cloth wipe world that I wanted to share! I forget where I originally saw them, but somehow during an Instagram deep dive I came across a beautiful and colorful post for Marley's Monsters un-paper towels. The post spoke to me immediately because as a family containing a woman who is allergic to mostly everything year round (dust and artificial fragrance) and also a tiny little man who is a professional boogie factory, we were in desperate need of a more sustainable solution for tissues. I'd buy the bulk pack of tissues from Target monthly. Four boxes of tissues then got divided up: one in the bathroom, one in the master bedroom, one in the nursery, and one in the living room. There'd also be one in the dining room/kitchen that we'd have to consider in the rotation. Oh and one on each of my desks. There were tissues everywhere. Because we used tissues ALL. THE. TIME. Tissues weren't ridiculously expensive (they are $4.49 for a four-pack at Target), but I could feel the waste every time I emptied smaller trash cans into my large kitchen bag before I took out the trash. The cascading pile of trash was 90% snotty tissues. Gross. And wasteful. So when I found Marley's Monsters post, I browsed her site long enough to find the smallest pack of cloth wipes to see if they'd even work for us, and made the purchase. Well, it turns out that we loved the wipes. We loved them even more after they were washed for the first time, because then they were more absorbent and softer. In came Chris, and as I offered him the last surviving tissue box when he had a sneeze attack, I wondered if he'd be able to get on board with the cloth wipes. Well, now we're a cloth wipe family of three. We use cloth wipes to replace napkins, tissues, and paper towels. I use them to clean, to wipe noses, and to entertain. Because I'm a shopaholic by nature, I perused the Marley's Monsters site many times after that. I saw the cloth wipe dispensers she offered and thought, "Maybe we need these as well." Then one day, the Andrea Sanders at @bezerowastegirl shared a post showing her cloth scraps in a big mason jar. She mentioned her family keeps these jars in various parts of the house in place of tissue boxes. Welp, now I fold my cloth wipes as recommended by Marley's Monsters and stick the roll into a large mason jar and voila, an instant zero waste tissue dispenser! PS: get 15% off at Marley's Monsters by using code HONEYRULE. It isn't complicated, I promise! Even though I had a moment where I considered throwing freshly washed-and-dryed cloth wipes in a jar without smoothing them out or folding them, I decided the presentation was better when they're folded and dispense "automatically"—meaning the next wipe comes out when the prior wipe is removed from the jar. In order to fold your wipes, start by laying one wipe flat. Take your second wipe, and place it flat, overlapping only half of the first wipe. Fold the first wipe up and in half over the second wipe. Take a third wipe and place it flat over the first folded wipe, overlapping by half. Keep folding these wipes in an accordion fashion until you have a neat stack. Then, roll up this stack as needed to fit into your container of choice, stick it in, and tug the inside-most wipe until the corner sticks out. Launder your used wipes in hot water and medium dry. 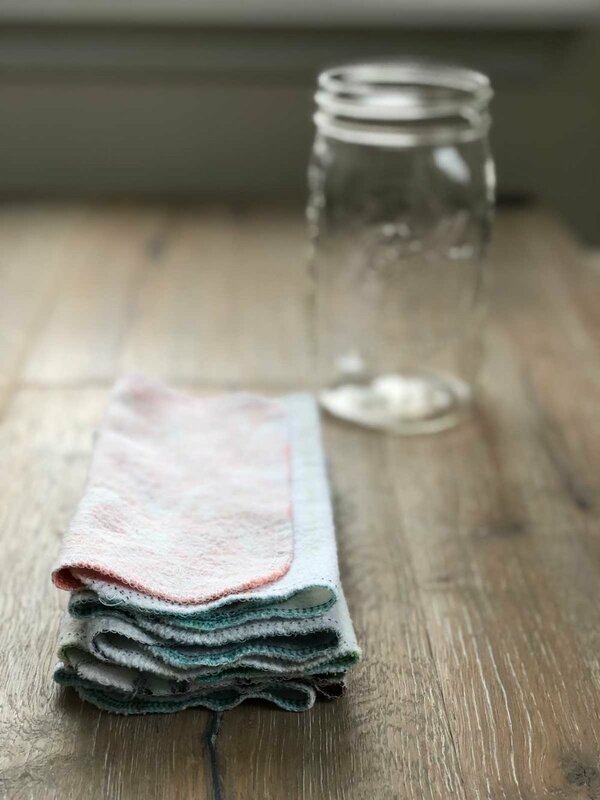 Sanitize your wipes with a steam iron (tip from Bea Johnson's book, Zero Waste Home). Be careful when using your wipes to clean up spills that may stain, i.e. coffee or spaghetti sauce. If you want to keep your wipes looking nicer for longer, give them a quick pre-wash before you throw them in the laundry. Have you switched over to handkerchiefs or cloth wipes? Or, is something holding you back? Comment below!